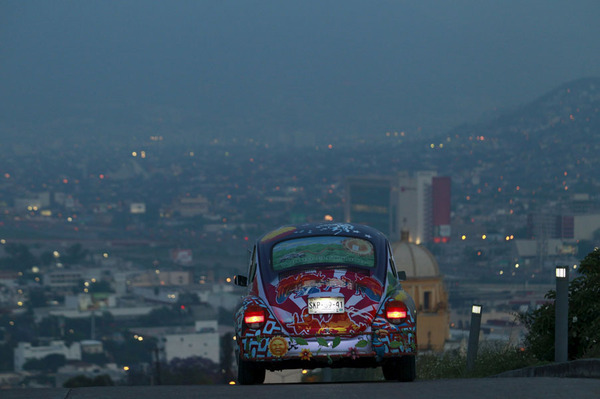 Driving in Mexico is the adventure and the destination. Like any slightly traveled American, I’ve crossed the Mexican border by car at either Tiajuana or Calexccio/Mexicali and driven the coast along the Sea of Cortez, or the Pacific coast in Baja California. However, it wasn’t until quite recently that I realized my Mexican driving skills resembled that of an Englishman diligently following British driving regulations on the highways of the U.S.
By renting a truck from Gecko located on the outskirts of Puerta Vallarta, we were given a complete package; surf and boogie boards, straps to fasten them to the truck, and instructions for the rules of the road in Mexico. Who knew that turning a blinking left signal does not announce one’s desire to make a left turn? Instead, it signals to the guy driving behind that it’s ok to pass. In Mexico, it seems the correct manner in which to make a left turn, is NOT to use a blinker, but to pull over to the right shoulder of the road and allow all the cars behind to pass — and when no one is coming from either direction, make that turn. After memorizing the “rules,” we mounted our truck and discovered that, like all good Mexican vehicles, everything was … well … “manual” — from the windows and the door locks to the map. Needless to say we didn’t know how to get to our destination of Sayulita. But, as a magician pulling a rabbit from a hat, Adam at Gecko swiftly produced a photocopied, hand drawn map of the route. Five minutes later we were on our way and lost. We are children of the digital age – maps are supposed to come with interactive arrows on well-lighted screens, not paper with scribble. So all three of us pulled out our phones and enabled $2/min. roaming data in order to get to highway Mexico 200 in the dark. As my friends in the front seat argued like all good married couples, I sat in the back and tried to keep the plastic cover of the cookie bin from squeaking while I peeled it off and gorged myself on Mexican sugar cookies drizzled with chocolate. And then there was GPS, so we finally figured out which turn would take us to Mexico 200 (and yes, it should have been obvious from the paper map, there were only two ways to go, right or left. One way led to Sayulita, the other to Punta Mita). About 60 seconds into the drive up the curvy 2 lane road, we caught up with an old convertible Chrysler Le Baron sporting a blue neon light illuminating its license plate so brightly that the interior of our truck turned blue. It was driving about 35 kph in a 60 kph zone. Every time the lights of an oncoming car appeared in the distance, Le Baron would start tapping the brakes, but continue moving forward, now at 15 … 10 kph until the oncoming car had passed. After nearly an hour of this, and an encounter with our first Mexican speed bump, we realized we had finally reached Sayulita. No shocks in this manual truck , so I was bounced right out of my cookie induced coma because, and, because Mexican speed bumps have no signs, and no gradual slope up the front or down the back, I suddenly understood why Le Baron was driving at the speed of a chicken truck. Sayulita is a small, once-fishing-village-now-mini-Puerta-Vallarta town of dirt roads with four sort of paved ones at the center, if cement and rock that form a sort of cobblestone counts a paved. But we were still on the town’s outskirts and quickly discovered our manual map did not have instructions for what to do once we arrived near Sayulita (beside drink beer and eat fish tacos). My married friends started their marital exercises in arguing about the map again. -Here?! You want me to turn down this dirt road!? It won’t go anywhere! -Yes it will, I remember it from last year. We bumped our way down the narrow streets to discover, yes, it was the correct street from last year, but this year it was blocked by broken slabs of cement preventing us from accessing the entrance to the street we needed. -Well it’s not my fault! I didn’t put the cement there! Turn around and then go left at the main street. -But the ocean is that way! So we did. A few more missed turns and we finally arrived at the plaza where we could easily locate our condo rental and start eating fish tacos and drinking beer…. So, how do you drive in Mexico? If you to eat cookies, don’t eat them in the back seat of a rental car with no maps when it’s night time and you can’t see the speed bumps.